Yesterday was a bittersweet day for me and my husband. My mom came over in the morning to pick Chloe up to go up–north (Oscoda, MI) to stay for two whole weeks. MY daughter is in love with all of her grandparents and values her time spent with all of them. Since my mom was coming over in the morning I decided to invite her over for some sweet and savory brunch. 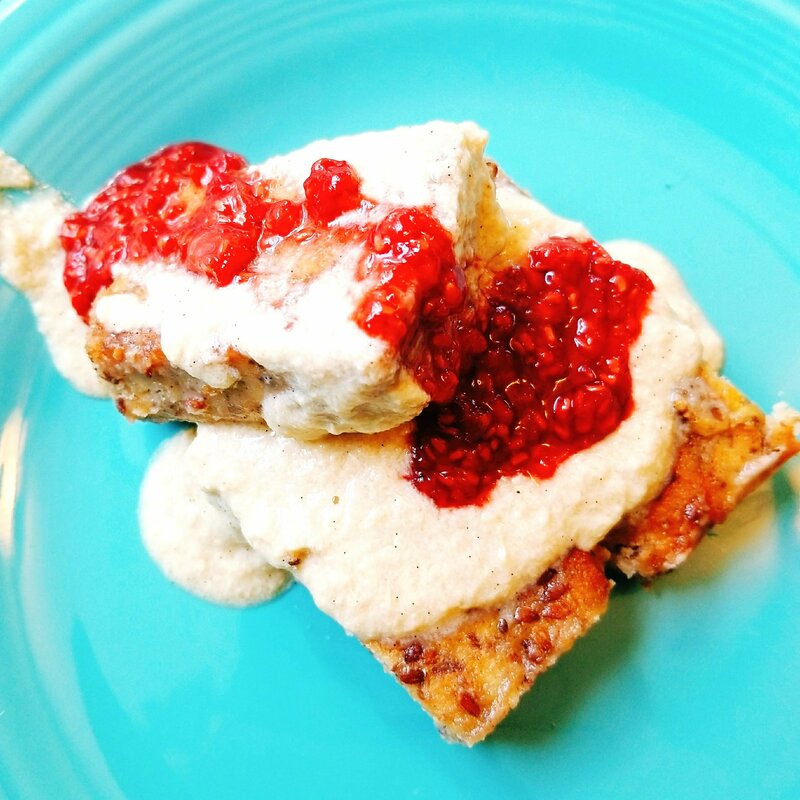 We had paleo French Toast with custard and raspberries.Â I believe she left with a full, happy tummy and a warm heart. I have been playing around with a French Toast recipe that I have for quite some time. I produce this dish in a variety of ways. I have served it as Unicorn French Toast and I have also served it with a mixed berry compote. I have posted images below for you to see. Having French Toast for brunch is becoming a weekly tradition in the Give It A Whirl Girl Kitchen. The process is a bit time-consuming but the outcome is worth all of the effort that I put into this dish. You want to know why it is so delicious? Because the main ingredient is LOVE! I start out by baking two small loaves of gluten-free bread. I use almond flour and tapioca flour to create the bread. A little bit of raw honey goes in there along with some almond milk and some ground flaxseeds and chia seeds. I prefer to pump my bread full of fiber with the chia and flax. They also have other health benefits as well. For this version, I also created a paleo friendly vanilla custard by using full-fat coconut milk, egg yolks, and by scraping the contents out of a vanilla bean. Making custard is a lengthy process with a lot of standing at the stove and whisking the mixture. I could not get my custard silky smooth yesterday because I am thinking I stirred my eggs in too quickly into the warmed coconut milk. It tasted fantastic though and had no added sugars. The raspberry compote was created with a pint of organic raspberries and a splash of pure maple syrup. I simmer that on the stove until it reduces down into a thick raspberry sauce. My mom had a hankering for some bacon with her French Toast so we fried up some Maple Leaf Farms duck bacon. Yeah, you heard that right…. DUCK BACON! Maple Leaf Farms specializes in a variety of duck items, including the bacon. The bacon has less fat than traditional bacon and it is just as versatile as regular pork bacon. My whole family really enjoyed this bacon, including my daughter Chloe who is usually not a fan of any type of bacon. She was clamoring for more she loved it so much! I also wanted to share with you that I finally own a plain white plate! How unreal is that? I live in a color-obsessed world and owning a white plate seems foreign to me. I had to add it to my Fiesta dinnerware collection. I just had to! I am on a mission to own every single color of dinner plates that they offer. I was pleasantly surprised to see how nice my meal looked on a plain white plate. Not too shabby! I really enjoyed having my mother over yesterday morning. I keep joking around with her about buying a house in the area and living around the block from me just so she can come by to enjoy the food that I whip up. Joking but not really! That really would be wonderful if my mom didn’t live so far away. I get a lot of pleasure from inviting people over so they can try out my food. Speaking of which, I was recently just informed that this year for the holidays, Thanksgiving and Xmas, I am going to responsible for hosting the gatherings! That will most certainly be interesting, especially Thanksgiving because I have never ever in my life cooked an entire turkey. It sounds like a fun project to tackle but it honestly makes anxiety creep up on me with just the thought of such a huge commitment. After brunch, my daughter loaded her suitcase into my mom’s truck. She will be gone for two weeks and I will miss her so much! She is my little blogger sidekick and I love the little foodie explorations that we do together. We said our goodbyes and I watched her leave. Our time away from each other will be great for everyone involved though so I am trying to look at the matter with optimism. I will be able to devote much more time to blogging and recipe creating. Chloe will be able to make some wonderful memories on her trip and her Grandma Kathie will bond over those two weeks. Also, my husband and I will get some much-needed alone time. So definitely going to be taking major advantage to all of this alone time over here. Joe and I spent the day together. We did a little shopping (I needed things for the blog of course). Joe is always my chauffeur. I am always appreciative of all his help and support in getting this blog up and running. We also got some fitness in with the dogs. We are dog-watching my sister’s little old chihuahua named Bebo. He has stayed with us a little over a week and he is always a joy to have around. I am usually not a fan of that breed of dogs but Bebo is super sweet and gets along very well with Stormy. They are definitely buddies! When we got home after our walk with the dogs we had a couple of beers and we ordered food from Pepperoni Grille through the GrubHub app. GrubHub is a fairly new food delivery service that will deliver food from various restaurants that are local. You can sign up through this LINK and save $10 off your first order that is $15+. We are pretty addicted to the convenience of GrubHub and it is so perfect for me since I do not drive (I have a severe phobia of driving). I am new to the world of craft beer and I honestly do not know how to discuss beer in any sort of lengthy, descriptive way (yet). The beer first was from Right Brain Brewery and it was called Blue Magic. The beer had hints of lavender in it and I really enjoyed the taste. I also had another beer with my salad and that was Mango Surprise from Arcadia Ales. I am not a big fan of the IPA beers but that one I did actually love the taste of. Very mango-ey! The salad that I received from Pepperoni Grille was pretty decent. I did get brave and ordered anchovies on the side because I have never tried out. I was just always grossed out at the thought of them. Turns out I was right~ they are way too salty. I liked the first one that I ate with my salad and then I got hit with the fishy salty aftertaste. Not cool! Joe had a pepperoni pizza for dinner and he enjoyed his pizza and said he could have probably eaten a whole large one by himself. I believe him too because he can pack in a pizza! Today is Sunday and I have to decide what I am making for dinner tonight. I love to make Sunday dinners special for my family. I have a bunch of Primal Kitchen dressings/marinades I can play around with so it might be something along those lines for dinner tonight. Do you have anything special planned for the day today? Leave me a comment and let me know. I would love to hear from my readers. Comments here do brighten up my day! DISCLAIMER:Â THIS POST CONTAINS AMAZON AFFILIATE LINKS. I DO RECEIVE A SMALL COMMISSION IF ITEMS ARE PURCHASED THROUGH THESE LINKS. ALL OPINIONS STATED HERE ARE MY OWN. This entry was posted in My Cooking Journey and tagged antipasto, Aracadia Ales, bacon, beer, bread, breakfast, brunch, duck, duck bacon, fitness, food delivery, french toast, gluten free, grubhub, lavender, mango, Mango Surprise, maple leaf farms, mom, paleo, Pepperoni Grille, Right Brain Brewery, salad, Stormy. Bookmark the permalink.